The one thing that "Down in Flames" series players are always looking for is additional aircraft for their favorite game series. So we have decided to satisfy that desire with our first "C3i-DiF Squadron" aircraft pack. This pack will consist of 64 fighter aircraft cards, printed in the eight-per-sheet (cut 'em out yourself) style of C3i-DiF module inserts that you've enjoyed over the years. Most of the aircraft cards will be NEW aircraft types, although we have included a few reprints (with corrected ratings) of aircraft that have appeared previously in one or more of the DiF Series games. Included will be such important aircraft as the British Typhoon and Tempest, the German Bf-109G-6/R6 and Fw-190F and the American P-63A Kingcobra (which was used extensively in combat by the Soviet air force). The pack will also contain a number of more obscure but interesting aircraft, like the Rumanian IAR 80, the German TA-152H and the Polish PzL 24, the only fighter in the Greek inventory at the time of the Italian invasion in 1941. Speaking of the Italians, there will be a number of Mussolini's fighters in the pack as well, including the Cr42 Falco, the M.C. 202 Folgore and the G.50bis Freccia. All of these planes will be done in the upgraded graphic style of "Corsairs and Hellcats", courtesy of Dave Lawrence, Martin Scott and Rodger MacGowan. The package will come wrapped in a ziplock format with an 11" x 17" (folded) cover/rulesbook. The front cover will be graced with Rodger MacGowan's gorgeous DiF Series style artwork, while the inside will contain the rules necessary to use the aircraft in DIF dogfights. Some of the rules will be reprints from "Zero!" and "Corsairs and Hellcats" for the benefit of those players who only own the European Theatre DiF series volumes ("Rise of the Lutfwaffe" and "8th Air Force"). There will also be a few new rules. For example, ace researcher Chris Janiec has come up with a way of modeling aircraft carrying a single, large caliber cannon, such as the P-39. 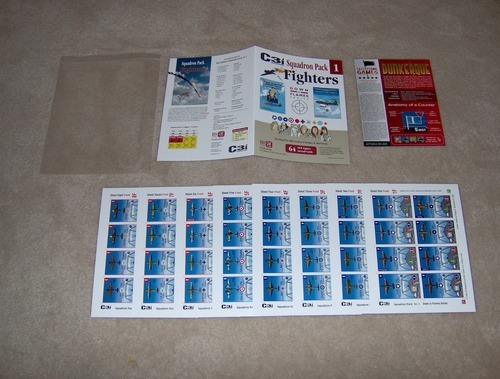 If this first "C3i-DiF Fighter Squadron Pack" proves to be popular, we're planning a series of these expansion packs. This is your chance to expand your "Down in Flames" series air force and add new aircraft cards at a very low price. Enjoy the games!